Mohammad Hamid Ansari is the 12th and current Vice President of India. 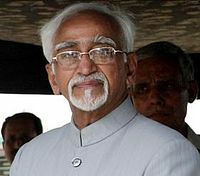 Ansari worked as an ambassador and served as Vice-Chancellor of the Aligarh Muslim University. "Imperative Need to Defend Universities as Free Spaces, Independent, Critical,Liberal"